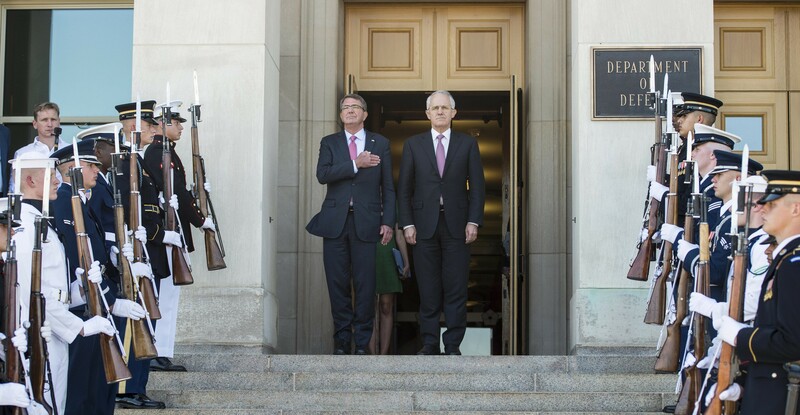 Australian and US military forces have worked together for almost a century. It’s a partnership forged under fire that has evolved into an alliance we should work hard to preserve. We first fought together in the First World War on 4 July 1918. Under the command and masterful leadership of the great Australian General Sir John Monash, the combined US and Australian force won the Battle of Hamel with minimum casualties in only 93 minutes. In 1942, US power saved Australia in the blackest period in our history. A strategic victory at the Battle of the Coral Sea removed the direct threat to Australia. And after the Second World War, the ANZUS alliance was created. It has been the cornerstone of our defence policy ever since. Since the end of the Vietnam War, US foreign policy in Asia has been based on three pillars: open and free trading; strong alliances; and the promotion of democratic institutions. The US has also maintained a strong military presence in North and East Asia, which has given us more than 40 years of peace, stability and prosperity. Australia has benefited enormously from this. But Australia has not been the only beneficiary of America’s presence in Asia; it has also aided Japan, South Korea, the ASEAN nations and even China. In more recent times, we have seen the US ‘pivot’ to Asia, announced by President Obama in Canberra in 2011 and intended to signal that the US was rebalancing its diplomatic and military forces towards the Asia-Pacific. It has been a mixed bag thus far. Among other initiatives, the US has worked to extend its influence in the disputed waters of the South China Sea, and it is likely to do the same in the East China Sea. If I were to offer advice to the incoming Trump Administration, it would be, firstly, that continuing with the alliance strategy that has been so successful in maintaining stability and creating prosperity for more than four decades is a more effective way to proceed than the alternative Trump raised during the campaign, which would see America pull back from its commitments in the Asia-Pacific and build a much larger maritime force. Second, tariffs at the level of 45%, which Trump has threatened to impose on China, would be disastrous for Australia and the United States. Indeed, all the countries of the region would suffer. As for Australia’s role, we should begin by cutting the talk about recalibrating the alliance. Now is not the time for Australian policymakers to change ANZUS or imply we are ready to move away from the US alliance. We need it more than most people realise. I have been disappointed with some of the comments I have read in Australia since the US election. The alliance system works very well, and we should be doing everything we can to maintain it. The United States is the stabilising glue that binds the region together, and there simply is no substitute for it. ASEAN is not cohesive enough to be robust on security issues, and while initiatives such as the annual ADMM+ gathering (at which the ten ASEAN defence ministers get together with their counterparts from the United States, Japan, China, South Korea, India, Russia, Australia, and New Zealand) are laudable, they are not an alternative to our alliance with the United States. It is critical that Washington continues to have a major presence in our region, and absolutely imperative that the ANZUS alliance continues. Australia should also emphasise the importance of the other US alliances – in particular those with the Republic of Korea and Japan. Given some of the statements made during the campaign, there is clearly some work to do to support these pacts. Going solo is not an option for Australia, because the cost to us would be enormous. At the moment the government is committed to spending 2% of GDP on defence, and this is already having an impact on other areas of government spending. If we lose the US alliance and the powerful security insurance it provides, we also lose access to its intelligence and its technology. It is likely we would have to increase defence spending to 3–4% of GDP. That would have a dramatic effect on public programs like health and education. We should endeavour to quietly influence the incoming administration as to the importance and success of the current US strategy in this region, including the Australia­–US alliance. Facebook's fake news: Why leave it to Zuck? One group hoping for the return of sanctions on Iran are the smugglers of Musandam, across the Strait of Hormuz. Exploring the murky depths of Papua New Guinea’s sea cucumber trade to China. Australia seems ambivalent about the UN role in the rules based order.